On Tuesday night Doyle was restless and had built herself a nest with the straw in the house and it looked like her time was due. After sitting with her until midnight, I went back at 2.00am and saw no progress. 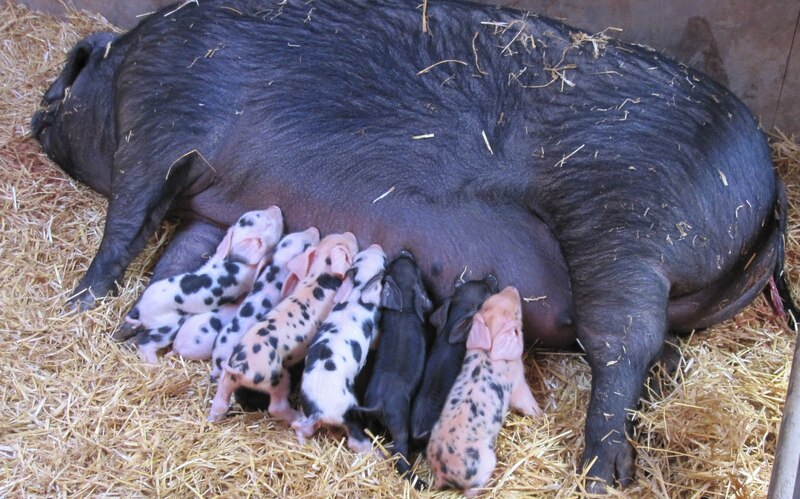 I went back again at 4.00am to see a little spotty piglet by her nose - the clearest sigh that delivery was in progress! The piglet wouldn't suckle and a few moment later a black package popped out. It was wet and wriggly. I wiped its nose with straw and it was breathing. I texted Mary with the news and she came over with tea. I tried to get the babies to suckle but if they squeaked Doyle reacted and moved around and I thought they might be squashed. I put them in a straw filled box under the heat lamp. Shortly after another spotty one arrived shortly followed by another black one. Then we waited, around 6.00 we had another spotty one and I went to wake the boys. When I was gone another black one came which Mary delivered. We were now at 6. The boys were thrilled and cuddled and played with them took pictures which they printed off and took to school. But I could still not get Doyle to stay still and allow them to feed. I called Derek a local experienced pig keeping friend who came over to look. 2 more arrived, spotty then black (keeping the pattern) but we still could not get Doyle to settle with them. 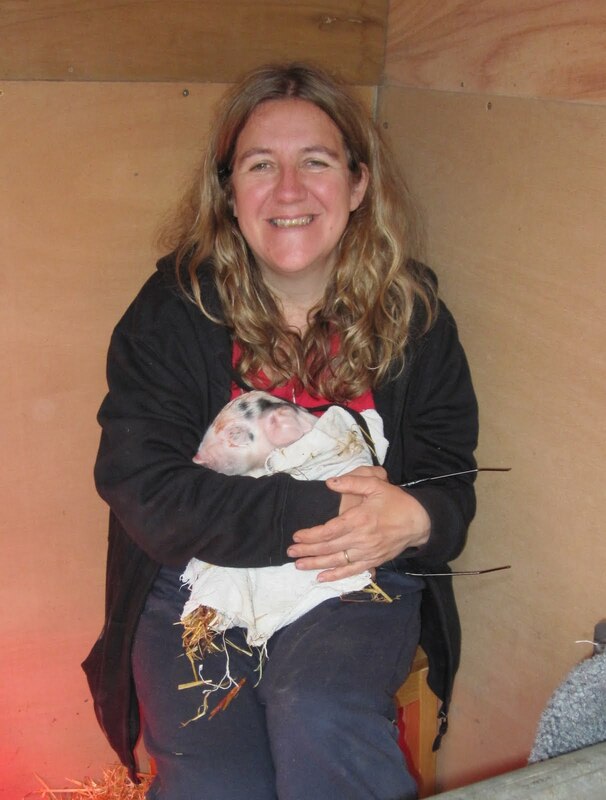 Derek then had to pop out so I kept retrying to reintroduce them one by one with her occasionally getting up and scattering piglets and keeper. 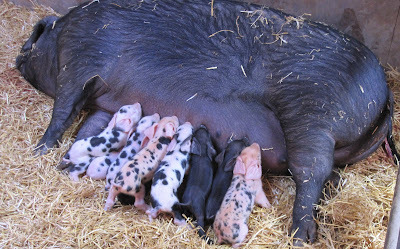 eventually by stroking her belly continuously and putting a pig board between her belly and head so the babies could not bother her, and she started to accept them. Derek returned and was happy with her position. She was still straining and so probably had one or more in her. She kept this up until around 10.30 when a really big spotty one came out, this one did not look good with an enlarged tongue hanging out but it did start breathing when we wiped it down. Derek then had to go and a few minutes later another spotty one popped out. Now we had 10. This one was well and started suckling quickly. We had more tea and, the afterbirth came and eventually after much watching Mary and I went for lunch. Later that day Mary and I had a disagreement about how many black piglets we had. I said 4 Mary said 5 as that is what she had counted when she sneaked back for a look at them. After much counting we discovered that it was 5 and the total was now 11 - one had been born while we were having lunch and they had just got on with it.